The chances of compromise and dialogue among Madagascar’s political actors are getting slimmer by the day. Violent confrontation between supporters of two former presidents and the government of President Hery Rajaonarimampianina have intensified recently following contested changes to the country’s electoral laws. Insiders say only a free election process and a level playing field can save the country from another full-scale crisis. This despite behind-the-scenes efforts to bring the main protagonists to agree on a compromise ahead of elections in November. Former presidents Marc Ravalomanana and Andry Rajoelina still have strong support and their parties have led numerous protest marches since the controversial electoral changes were voted in by Parliament in February. Opposition supporters fear that both Ravalomanana and Rajoelina could be barred from participating in the polls, leaving Rajaonarimampianina to run for a second term uncontested. The two former presidents could be excluded because they are still facing criminal charges linked to violence during their terms. Ironically, the violent crackdown against the opposition on 21 April, in which one protester died, could lead to similar accusations against the current president. On 4 May the Constitutional Court heard complaints by the opposition about the new electoral laws and ruled that the stipulated prerequisite for presidential candidates to present their criminal records should be withdrawn. 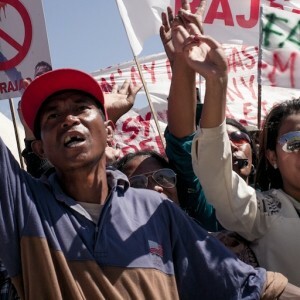 In a roadmap drawn up by the Southern African Development Community (SADC) to solve the previous crisis, it was agreed that amnesty would be granted to the main political actors in Madagascar. In return they agreed not to participate in the 2013 polls – an unpopular compromise imposed by SADC. At the time SADC and its mediator, former Mozambican president Joaquim Chissano, saw this as the only way out for Madagascar, which had been under sanctions since the 2009 coup d’état against Ravalomanana. The amnesty, however, was never granted. SADC has tried to stabilise the country, but not hard enough. After the previous elections it closed its office in Madagascar without ensuring dialogue and reconciliation happened. It presumably took its eye off the ball in Madagascar because of its own limited capacity and other urgent crises to attend to. SADC knows the dangers of the current situation and deployed a fact-finding mission to the island last month. At a summit meeting on 24 April it decided to again encourage a national dialogue and to reappoint Chissano as mediator. It also urged cooperation with the African Union and the United Nations in Madagascar. With his fluent French and stature as former recipient of the Ibrahim Prize for Achievement in African Leadership, Chissano is well placed to mediate in Madagascar. However many on the island feel so strongly that Chissano and SADC imposed an undemocratic solution on them the last time around that he is unlikely to make any headway. Clearly the previous roadmap is dead in the water. SADC will have to argue that the previous election compromise – to exclude the two ex-presidents – was just a stop-gap solution to prevent violence and that everyone should now be allowed to run. But all is not lost for SADC, and the regional organisation has seen some major changes in the past few months. South African President Cyril Ramaphosa is SADC’s new chairperson (until South Africa’s term expires in August); and the Organ for Defence, Politics and Security is led by Angolan President João Laurence, also a new kid on the block. Meanwhile SADC has numerous tools at its disposal to help Madagascar. The first of these are the SADC Principles and Guidelines Governing Democratic Elections. These are guidelines for SADC election observers, but have had uneven results. Guidelines that level the playing field ahead of the elections, such as equal access by all parties to public media, are rarely imposed and monitored. In Madagascar this is sorely lacking. They also call for an independent and credible electoral commission to run the elections, and an inclusive, democratic process. Secondly, instead of brandishing the stick of sanctions, SADC can offer Madagascar economic incentives such as greater inclusion in its regional economic industrialisation plans, in return for adhering to demands for national dialogue. Madagascar is one of the few SADC countries not part of SADC’s cross-border payment system housed in South Africa and destined to promote inter-regional trade. South Africa, with its dominant economy in the region, is particularly well placed to negotiate favourable trade terms with Madagascar. At an investment drive by Rajaonarimampianina in Pretoria last year, it was noted that Madagascar’s exports to South Africa grew from about US$45 million in 2012 to over US$123 million in 2016. These exports included textiles, mineral products and other commodities and vegetables. Madagascar remains one of the poorest countries in the region and needs stability for economic growth. According to the World Bank, Madagascar grew by around 4% in the past four years. But there are fears that the repeated political crises that have stifled growth these past few decades will again wreck the country’s chances of economic development. Madagascar contrasts with rivals such as Mauritius, with a much smaller population, but a dynamic private sector and a stable political environment. Mauritius has consistently come out tops in surveys such as those of the Mo Ibrahim Foundation, the World Bank’s ease of doing business and others. Its per capita income is close to US$10 000 and its long-term plan is to become a high-income country. Madagascar has, by contrast, a per capita income of just over US$400, one of the lowest in the world. With its abundance of rare commodities such as vanilla, its numerous export products and availability of arable land, Madagascar should be doing better. This despite extreme weather conditions that impact on agricultural production and high living costs. But for economic growth to happen, political stability must be guaranteed.